Steel mills are seen in Hamilton, Ont., on May 31, 2018. 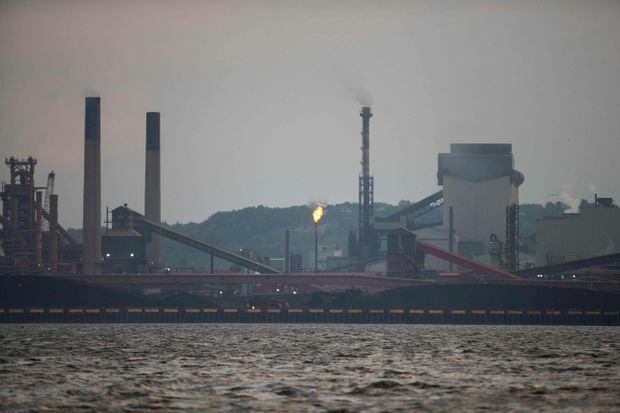 U.S. President Donald Trump slapped tariffs on Canadian steel and aluminum on June 1, sparking the most serious trade war between Canada and its largest trading partner in recent memory. Prime Minister Justin Trudeau is fighting back with levies of his own on U.S. goods. In total, more than $33-billion worth of annual business – and tens of thousands of jobs on both sides of the border – are at stake. Things could get far worse: Mr. Trump has threatened a 25 per cent tariff on Canadian-made cars and trucks, which would put even more jobs in jeopardy than the steel and aluminum levies do. What are Mr. Trump’s tariffs, and why is he imposing them? Mr. Trump won the 2016 election on a nationalistic platform that included erecting trade barriers to protect U.S. manufacturing from foreign competition. In March, he announced tariffs of 25 per cent on imported steel and 10 per cent on aluminium. He used Section 232, an obscure piece of U.S. trade law that allows tariffs to be imposed for national security purposes, as a basis. The President temporarily exempted several countries, including Canada, to give them time to negotiate permanent exclusions. The Trump administration said Canada and Mexico would be permanently exempted only if they reached a deal to renegotiate the North American tree-trade agreement (NAFTA) by June 1. When they did not, Mr. Trump went ahead with the tariffs. He also hit the European Union with levies the same day. Canada is the largest supplier of steel and aluminum to the United States, exporting $16.6-billion worth in 2017. The U.S. is Canada’s largest customer, accounting for more than 80 per cent of all Canadian exports of the metal. There are about 30,000 jobs in Canada’s steel and aluminum industries, spread across the country from Hamilton and Sault Ste. Marie, Ont., to Regina to Jonquière, Que., and Kitimat, B.C. Mr. Trudeau has announced 25 per cent tariffs on $16.6-billion worth of U.S. products to mirror “dollar-for-dollar” the amount of Canadian steel and aluminum subject to U.S. levies. Goods facing Canadian tariffs include steel and aluminium, and a long list of consumer products. The goods have been chosen to inflict maximum political pressure: Orange juice from the key swing state of Florida; bourbon from Kentucky, the home of Republican Senate Majority Leader Mitch McConnell; pickles from House Speaker Paul Ryan’s Wisconsin. The Canadian government is holding public consultations on the tariffs and will start levying them on July 1. What are these auto tariffs Trump is talking about? The President is threatening to impose 25 per cent tariffs on all vehicles imported into the United States, using the same Section 232 national security rules that he did for steel and aluminium. Under that process, the Commerce Department has six months to conduct an investigation and then recommend on whether to bring in tariffs. Such a move would be even more damaging to Canada than the steel and aluminum tariffs: It would hit $80-billion of Canadian exports and 120,000 jobs, four times the amount affected by steel and aluminum levies. “Auto tariffs would truly burn down the North American integrated economic framework,” warned Eric Miller, a former Canadian diplomat and Washington-based business consultant. Where is NAFTA in all this? Canada tried last month to cut a deal with the United States on NAFTA under which Ottawa would agree to U.S. demands on the automotive sector, and possibly open up its protected dairy market to more foreign imports in exchange for the Americans taking most of their other NAFTA demands off the table, sources with knowledge of the negotiations said. National economic adviser Larry Kudlow, Treasury Secretary Steve Mnuchin and Jared Kushner, Mr. Trump’s son-in-law, were receptive, the sources said. But U.S. Trade Representative Robert Lighthizer shot it down. On virtually every major U.S. demand in the NAFTA talks – including tough new Buy American procurement rules, the abolition of the deal’s dispute-resolution mechanisms, and a “sunset clause” that would terminate the deal in five years unless all three countries agree to extend it – Canada and the United States are at loggerheads. Mr. Trudeau revealed last week that he pitched Mr. Trump on a leader-to-leader meeting in Washington to resolve NAFTA. But Vice-President Mike Pence insisted Mr. Trudeau agree to the sunset clause in exchange for getting a meeting. Mr. Trudeau refused. Adding to the chaos, Mr. Trump has floated the possibility of breaking up NAFTA and cutting separate deals with Canada and Mexico. One possibility is for Canada and Mexico to agree to incorporate North American steel percentages into the NAFTA auto rules. This could be enough to get the United States to lift tariffs while they continue negotiating the rest of NAFTA. The Americans have also asked Canada to agree to a quota that would limit how much of the metals it sells in the United States, said people with knowledge of the talks, but Canada has so far been reluctant even to discuss such a measure. Canada is also pursuing complaints against the United States at NAFTA and World Trade Organization (WTO) tribunals. Given the glacial pace of those processes, rulings are unlikely to come any time soon. One wildcard is U.S. domestic politics. Canada has plenty of support from the U.S. business community and Republican members of Congress: Nebraska Senator Ben Sasse described the tariffs as “dumb” and said Mr. Trump was trying to “Make America 1929 again.” Even Charles and David Koch, the right-wing billionaire industrialists, are planning a massive campaign against the tariffs. Laura Dawson, director of the Canada Center at the Wilson Institute think tank in Washington, said the purpose of the tariffs is, in part, for Mr. Trump to score political points with his base before mid-term elections. But in one way, she said, Canada is better off in this tariff fight than in others.